No other enzyme cleansing product on the face of the earth can compete with Z7 when comparing cost savings for growers and plant growth performance. We have not had a single customer complaint after they used Z7; even those using the worst well and irrigation pipes and tanks. Z7 helps you keep money in your pocket to spend on other things. 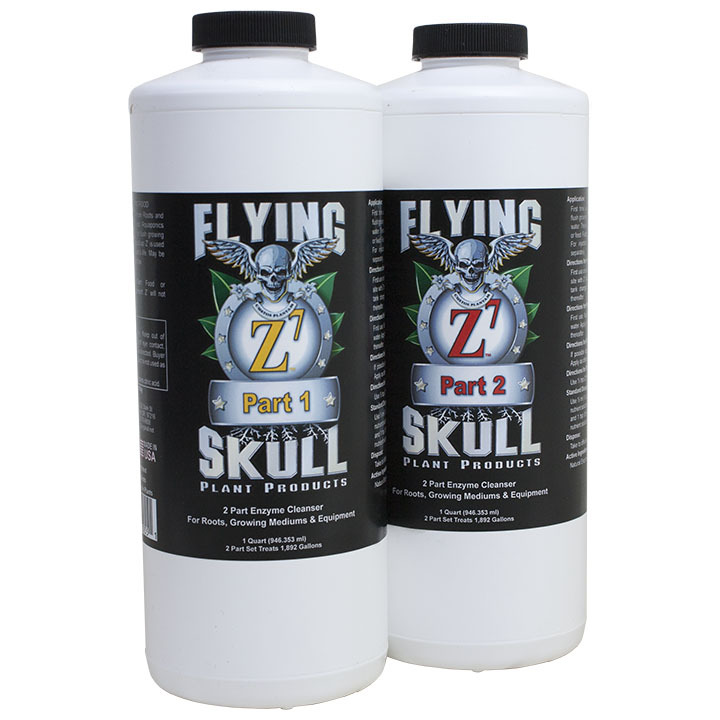 Z7 helps to keep hydroponic roots, piping, sprayers, tubes, and tanks cleansed while the plants are growing! Z7 will reduce many hours of cleansing between harvests and in most cases eliminate taking the hydroponic or irrigation systems apart. This will reduce downtime, reduce labor costs and help minimize the replacement of foggers, tubes, pipes, sprayers, drippers, and pumps. The reduction of plant death due to clogged drippers, tubes and sprayers will pay for using Z7. All the other benefits of Z7 is free and money in the pocket. 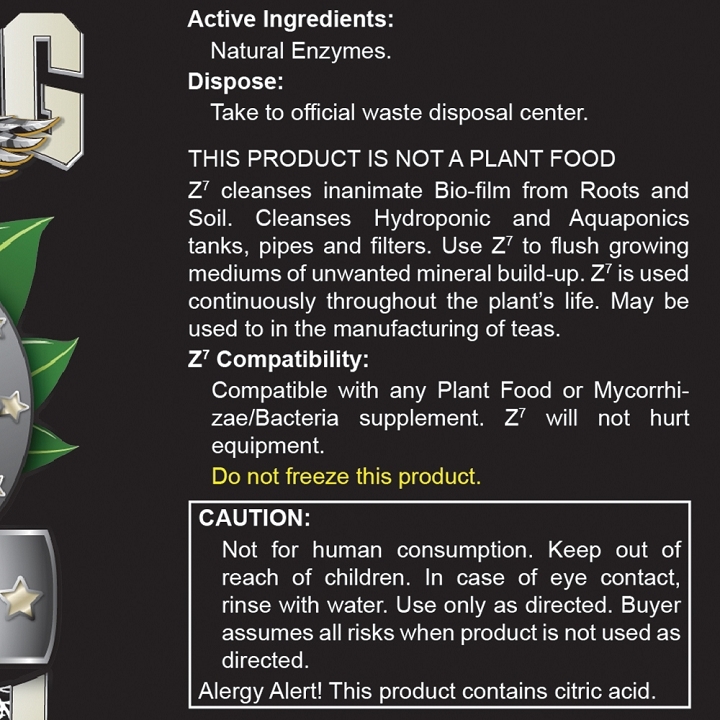 For established plants having problems, mix up the Z7 in water. Pour as much Z7 treated water through as the pot as it takes to thoroughly wash all minerals from the soil. For plants being transplanted into virgin soil, apply enough Z7 to soak the soil. The Z7runoff from the soil should match the EC/PPM of the water supply, and then you will know you did a proper flush. Z7 in the ultimate water conditioner. When introduced into a contaminated irrigation equipment that uses sprayers or drippers, Z7will go to work to eliminate inanimate slime, inanimate slimy conditions, plant waste, organic particulates, cloudy water, odors and mineral buildup on roots, growing medium, irrigation hardware and pumps. When introduced into a freshly cleaned irrigation equipment system, Z7 will maintain an internally cleansed environment and prevent inanimate slime, inanimate slimy conditions and mineral build up. At the same time Z7 is cleaning each individual root, opening up microscopic passage ways that were blocked and restricting osmosis. Z7can reduce the cost of fertilizers by as much as 25% although some growers report a 30-35 percent reduction in fertilizer use. Flying Skull Plant Products publishes and reports the lower number until further studies have been done. Less fertilizer nutrients and water usage are needed because the plant root’s cell structure, water mineral content and plant food particle size is more conducive to the osmosis process. Z7 is compatible with mixing and auto dosage systems. It is mixed at ½ cc of each part per gallon. 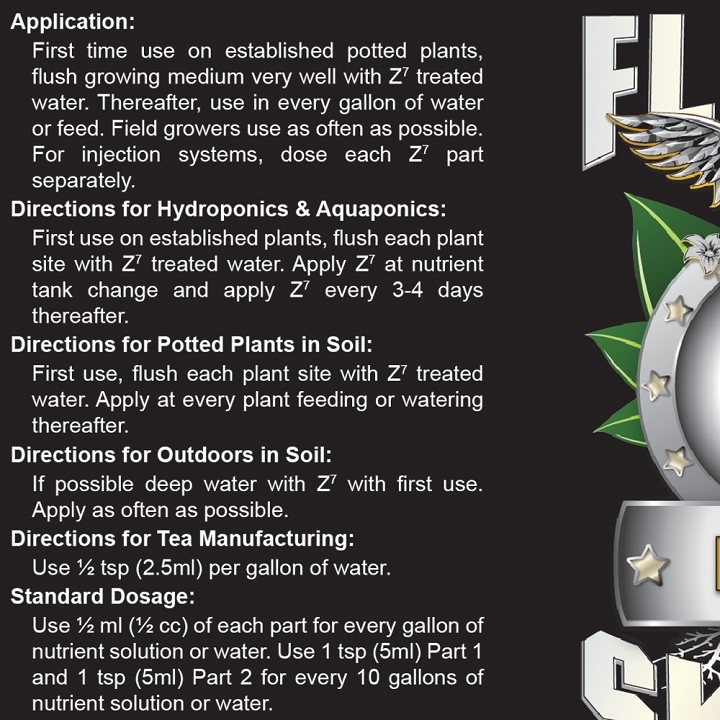 Growers can add Z7 to water to make it less concentrated for equipment that can’t be dialed in at super low doses.